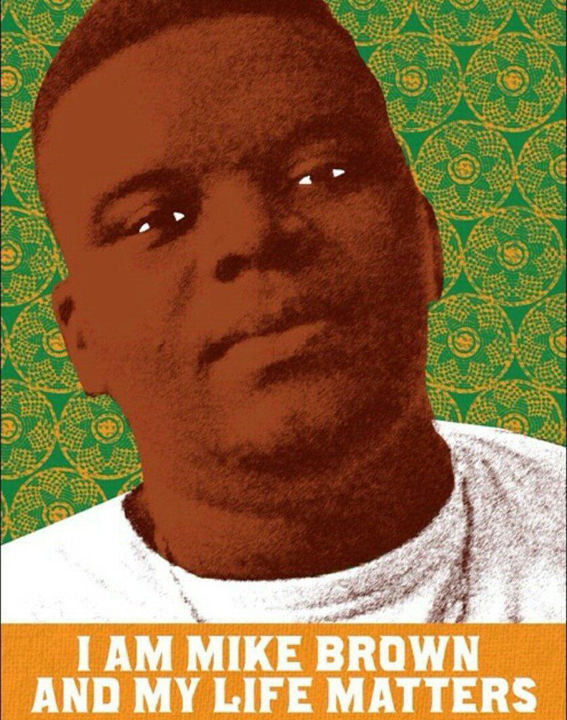 In light of the police murder of the martyr Michael Brown and the ongoing struggle in Ferguson, Missouri, in the United States, the Popular Front for the Liberation of Palestine salutes and stands firmly with the ongoing struggle of Black people and all oppressed communities in the United States. Comrade Khaled Barakat said in an interview with the PFLP media outlets: “Police brutality, oppression and murder against Black people in the U.S., and against Latinos, Arabs and Muslims, people of color and poor people have never been merely ‘mistakes’ or ‘violations of individual rights’ but rather are part and parcel of an integral and systematic racism that reflects the nature of the political system in the U.S.
“Every time a crime is committed against Black people, it is explained away as an ‘isolated incident,’ but when you see the massive number of ‘isolated incidents,’ the reality cannot be hidden – this is an ongoing policy that remains virulently racist and oppressive. The U.S. empire was built on the backs of Black slavery and the genocide of Black people – and upon settler colonialism and the genocide of indigenous people,” said Barakat. The U.S. empire was built on the backs of Black slavery and the genocide of Black people. The people of Ferguson are resisting, in a long tradition of Black resistance, and we support their legitimate resistance to racist oppression. “As people in Africa, Asia, Latin America and the Arab world see the brutality of the United States outside its borders, these communities confront its racist and colonial oppression within the borders of the U.S. The two are inextricably linked,” said Barakat. “We also see U.S. exploitation and plunder of people’s resources around the world. 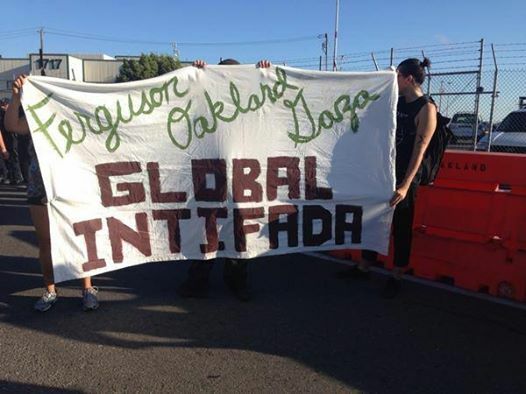 Oakland, rallying in solidarity with Ferguson and Gaza, calls for a global Intifada. Barakat noted: “Mass imprisonment and incarceration has been a central tool of racist control in the United States. One out of every three Black men in the U.S. will be imprisoned; every 28 hours a Black person is killed by the state or someone protected by the state. “When we see the images today in Ferguson, we see another emerging Intifada in the long line of Intifada and struggle that has been carried out by Black people in the U.S. and internationally. The Palestinian national liberation movement salutes the Black liberation movement and has learned so much from the experiences of Malcolm X, Martin Luther King, Frederick Douglass, the Black Panthers, Sojourner Truth and generations of Black revolutionaries who have led the way in struggling for liberation and self-determination,” said Barakat. “The struggle inside the United States is an integral part of the struggle against imperialism – in fact it is central, as it is taking place ‘in the belly of the beast.’ This is also the case for the struggle of Indigenous peoples and nations throughout North America, where settler colonial powers have been built through land theft and genocide, yet where indigenous people have always resisted and continue to resist today,” he said. “Every victory inside the United States and political achievement by popular movements and liberation struggles is a victory for Palestine and a victory for a world of human liberation. Those who think that the fate of people in the United States lies with the ruling class parties, the Republicans and Democrats, until the end of time, are living in an illusion. So too are those who believe Palestine can find freedom by seeking alliances or guarantees by those who oppress Black people,” said Barakat. The Black struggle is leading the world in the struggle for an alternative political system that will bring U.S. empire to defeat. “The Black struggle is leading the world in the struggle for an alternative political system that will bring U.S. empire to defeat. We know that this will happen only through struggle, through organization of people emerging from uprisings and communities rising in anger against injustice,” said Barakat. 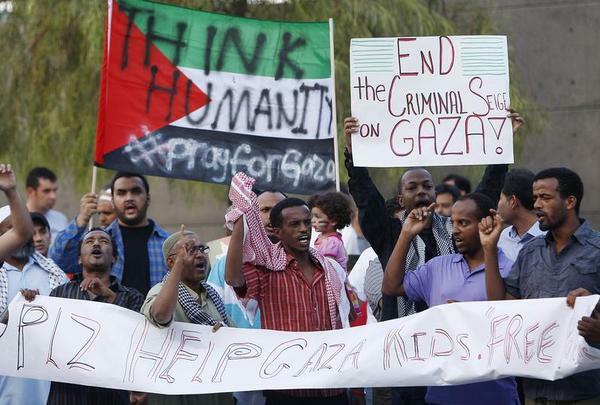 “The anti-racist movement and anti-Zionist movement are not and cannot be separated. Fighting against racism means fighting capitalism; fighting against capitalism means fighting for socialism,” Barakat said. The Front encourages all Palestinians, and especially our Palestinian community in the United States, to continue and intensify their efforts in support of the Black liberation movement, from joining actions in support of Ferguson and in honor of Michael Brown to long-term and sustained joint struggle and mutual solidarity with the Black movement. There are long histories of this work, and it is critical for all of our communities to expand and deepen our links of struggle and solidarity. The Front encourages all Palestinians, and especially our Palestinian community in the United States, to continue and intensify their efforts in support of the Black liberation movement. The PFLP sends its revolutionary greetings, its solidarity message and its salutes to the struggling people of Ferguson on the front lines confronting U.S. empire and to the generations upon generations of Black struggle. Our Palestinian liberation movement is part of one struggle with the Black liberation movement. This has been a position of principle for the Front since its founding; we reaffirm this stand today and will always do so until both of our peoples – and our world – are liberated. This story first appeared on the website of the Popular Front for the Liberation of Palestine, at http://pflp.ps/english/2014/08/19/pflp-salutes-the-black-struggle-in-the-us-the-empire-will-fall-from-within/.